I pulled the honey super off the July split on the 14th. There were still bees in it, I think because brood had been hatching. The good news is that the bee excluder did its thing. The bees had drawn the black plastic in the upper hive body, had capped brood in the center frames and capped honey on the sides. Yeah! These girls might make it. The bad news: For the second time in a row, the bees had waxed the bee excluder to the frames of the hive body, and the random pieces got pulled loose. This one isn’t as bad as last time and I can fix it. However, last year was the first time they did it, and I’d like to know why so I can stop having to repair or replace the bee excluder every time I pull honey. 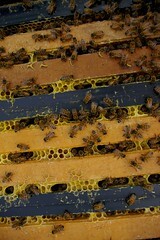 The May split had bees crawling all over the second super, but no wax or honey added. I’m just glad they know they have space, and hopefully are filling the super below. The original hive was only now putting honey in the super. They had however gotten the hive body full. I don’t know whether I’ll get any capped or not. I went in again on the 22nd. There were bees cruising everywhere, but from the way they’re all over the turkey’s watermelon, I think they’re getting a bit desperate. Not surprising, as there’s darn little still in bloom. I think I was a bit optimistic about the hive bodies on the 14th. The July split still has several frames to draw. I slapped a feeder on it.The original hive really didn’t seem to have laid down a lot more honey, and when I looked more carefully at the hive body, they have room too. I put the bee excluder on them. I’m not sure what to do with the uncapped honey in the super. I’m leaning towards just storing it till next year. The May split still hadn’t done anything with its’ second super, so I just took it off. With no honey, it should just empty out and I can take it in tomorrow. I pulled the lower super to look at the hive bodies, and they did try kill me. There is a way in at the throat of the bee suit that needs to be dealt with. I’d like to move the bee excluder Friday, so I can extract Sunday. We’re also short a feeder. There’s a little plastic thing that broke in our third one. I think I’ll break down and buy another just to feel safe.